There I was, minding my own darn business at my usual TJ's, chillin' out in the frozen aisle, when Trader Joe's Vegetable Spring Rolls went flying through the air and right into my cart. Nah, seriously, courtesy of Pam AKA the Frozen Queen. Must be payback from that one time I demanded she find me churros and find me churros NOW. I've nagged her every time I've seen her since about anything new and interesting, and I guess this time she skipped the small talk and got right down to some serious appetizer business. "You gotta try them!" was all she said with a wink and a smile. Yes, ma'am! Sorry it took me so long to get around to them, Pam. You wouldn't think it'd take a guy like me so long to finally try them out. But turning on the oven in this heat in a 101 year old brick house with no AC...you can understand, right? Well, as it turns out, you don't have to stick them in the oven. Once I actually looked at the box, a recommended cooking method is zapping them to defrost a little, then sizzling in a skillet for a few minutes. I really hoped this make a perfectly acceptable, semi-greasy, crispy, spring roll full of warm veggie material - Kale! Edamame! Forget all the salt, this is health food! - that would be worthy of a full stamp of approval. Unfortunately, even after defrosting, and frying them for over twice as long as stated to - the centers were still cold and clammy. This was with significantly browned wrappers. I don't see how this is user error. Sigh. Everything else seemed right, or close to it, at least. The veggie mix - kale, edamame, mushroom, carrots - were about on par for a frozen spring roll, and blended nicely with the little bits of tofu in there. Nothing seemed too chunk or stood out too strongly, which was welcome from a textural standpoint - even Sandy ate them without complaint, and normally mushrooms make her gag. Those veggies were seasoned fairly liberally with soy sauce and salt, and probably would have been better if more restrained. A little bit of black pepper helps balance that out, though. For a small handful of bucks (maybe $3 or $4) I can't say I was overly thrilled, but wasn't terribly disappointed either. 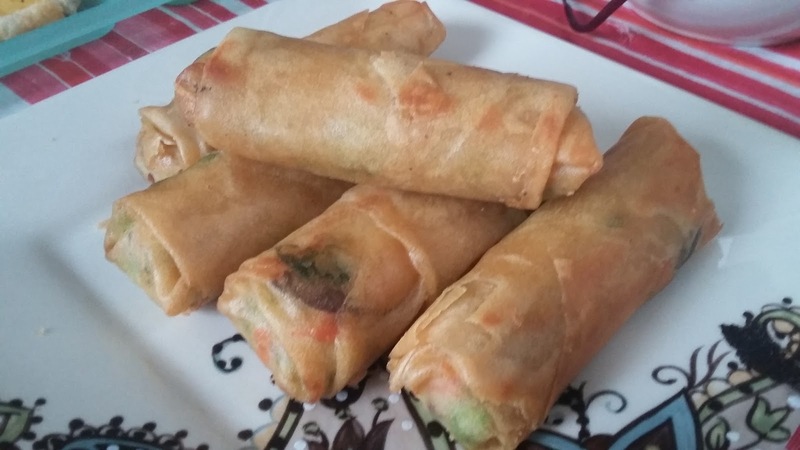 Sometimes a spring roll is just a spring roll and that has to be okay. Such is the case here. Sandy liked them a little more than I did, and we'd buy again. Just hope Pam doesn't throw anything else at me after this review. We made these in the toaster oven and they came out perfect! Steaming hot on the inside with a super crunchy wrapper. Loved them! That's how I heated them also, they were perfect! Absolutely delicious. I agree with Emilee. Baking them is the way to go. They come out hot, crispy, and delicious every time. Give these another try, Russ. I just had these last night with their vegetable gyoza for dinner. I made them in my air fryer & they came out perfectly crisp & heated through. Yes, microwave them first and put in toaster to finish. Soooo good! I agree completely. I microwave two of them for 90 seconds and then place them in the toaster for 90 seconds, flip them over and let them go for another 90 seconds. They are absolutely delicious. They come out great in the oven! Nice hot and crispy! Heated them in toaster oven and they were amazing. I'm officially addicted. In the oven, flipped halfway through and so good.